Inspired by a good friend to take a closer look at the mounds of artifacts buried in thrift shops, I decided to brave our local thrift scene once again. This time instead of looking for obvious treasures, I tried my best to keep an open mind and really look for the potential in each item I unearthed. Seeing potential is a skill that takes extra effort, but one which pays tremendous rewards to those who give it a chance. 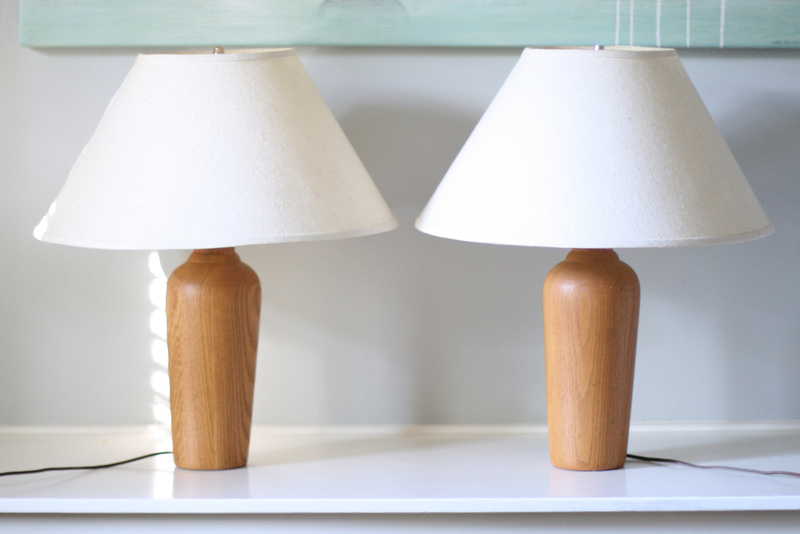 That Sunday I went home with two wooden lamps that functioned just fine but needed a little love, at least I thought so. A few years back I purchased a couple of drum shades and had searched tirelessly for lamp bases that were both affordable and suited my taste. Finally, I felt like I found a match. You may have noticed that I like white a lot, and also have a thing for any object with the "dipped" two-tone look. So it's no surprise that I decided to take that approach this time too. I'm still not sure if I'm sold on the dipped look here but I can always paint it white or sand it again. What do you think? Do you have any favorite thrift store finds? To be honest, I've wanted to build a custom-sized pin up board for a while now. In fact, I think it's been on my to-do list for over a year. 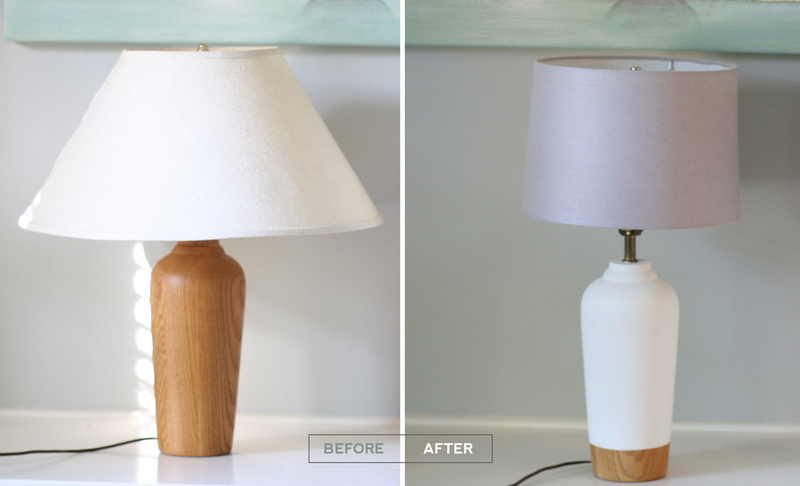 Anything custom can be scary, especially when straightforward DIYs are difficult to find. Believe me, I searched for pin up board tutorials and didn't find much. It could be my google skills but regardless, with a lack of search results, I felt intimidated. In a world full of pinterest boards, it felt a little unnecessary to be so committed to a real-life pin up board. I mean, is it really necessary to have a board full of tangible paper goods and random inspiration? Well, I think so. particle board: 48" x 12"
I took photos of each step with my "real" camera but when my memory card unexpectedly erased all of my documentation, I was grateful I captured most steps with my iPhone too. Below I'll share the steps I took to make my vision for a physical inspiration board a reality. 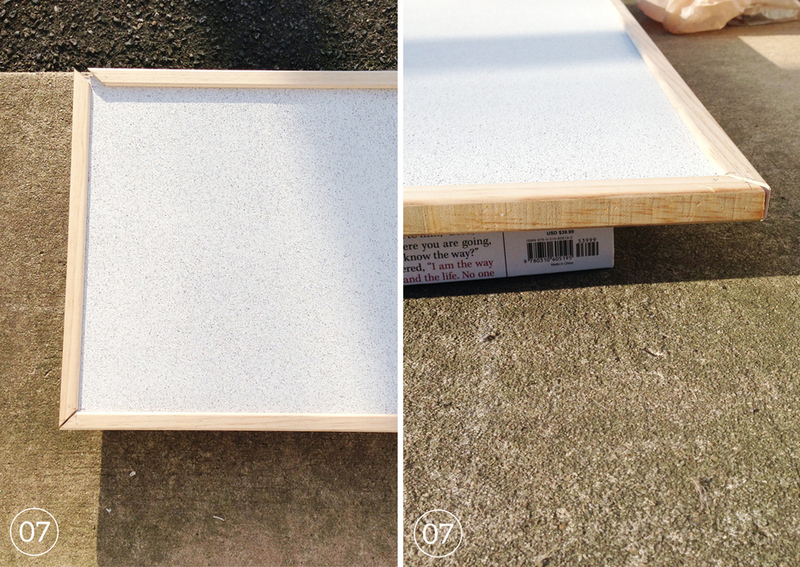 01 | Accompanied by lots of gratitude, ask your home improvement team of choice to cut the particle board to size. Choose board proportions that work for you and your space. 02 | Apply spray adhesive to the particle board, and then carefully lay the board (sticky side, face down) onto the rolled out cork. 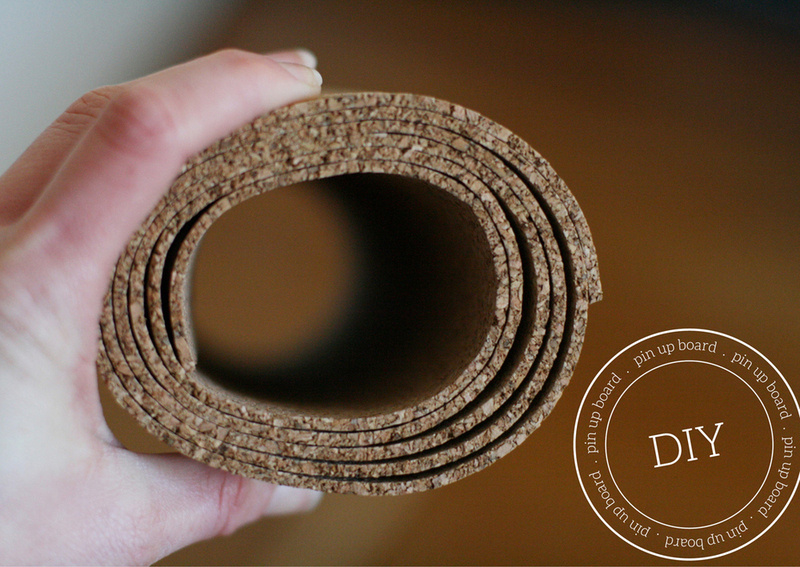 Use a generous amount of spray adhesive since cork is extremely porous and don't forget to cover the edges and corners. 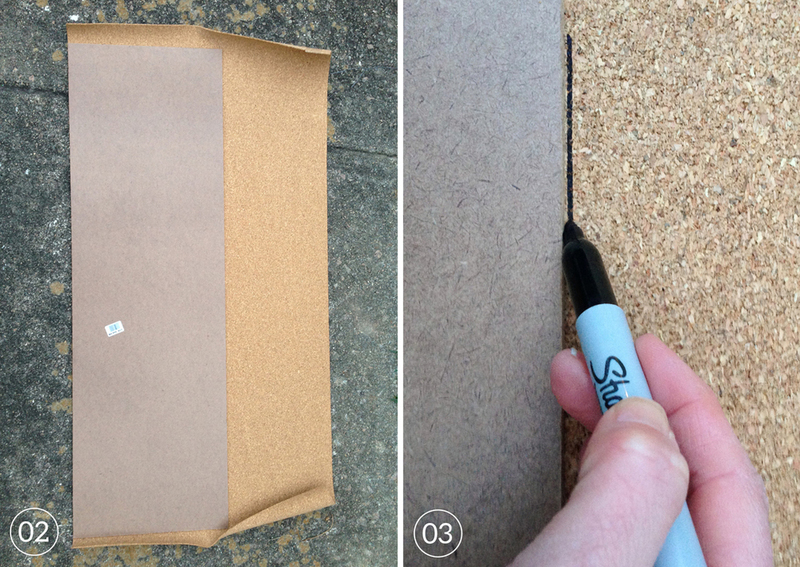 03 | Once the cork and board are safely attached, trace around the particle board with a Sharpie marker to outline the designated trimming zone. 05 | Cut the L-shaped edging trim to size. (I mitered the corners with a small saw we already own. Since we don't have a mitering saw, this was definitely a trial-and-error process, for me. It involved a lot of measuring and assembling. I wish I could explain this process more clearly, but it's a little difficult to explain, after the fact.) Before moving onto the next step, be sure that the L-shaped trim pieces fit well around the edges of the board and that the corners of the trim match up. 06 | Spray paint the cork board. Honestly, it would have been more effective to paint the cork with a paint brush. 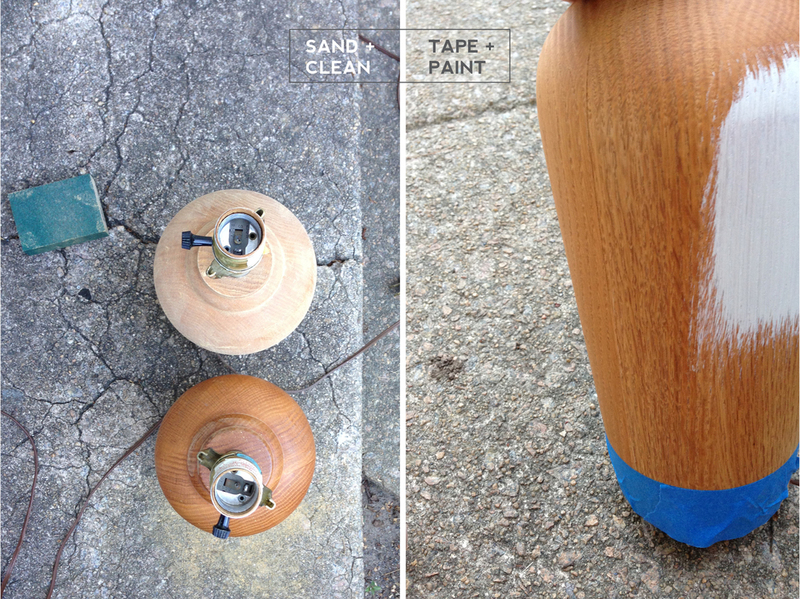 Since the cork is so porous, I almost used an entire bottle of spray paint to achieve a thorough coat of white paint. 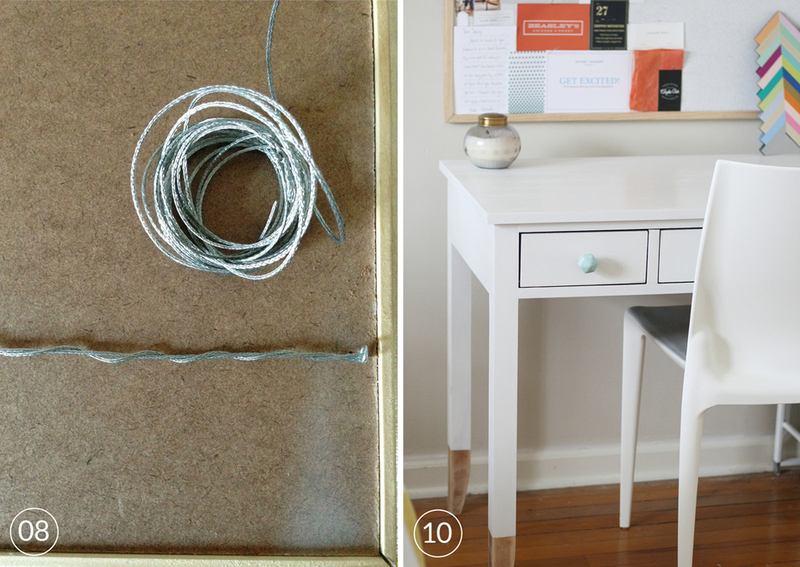 07 | Glue the trim to the cork board with liquid nails. I completed this process outside, but in cooler temperatures the glue took a little longer to cure. In my experience, this process seemed to work better the second time around. I elevated the board and trim above the ground by placing books below them. This way I could easily access all sides and gauge where the glue was really sticking. 08 | Drill pilot holes into the back of the particle board. Be careful not to drill too deep. You want to avoid penetrating the cork on the front side. Once the holes are drilled, screw in the picturing hanging hardware. 09 | Finally, it's time to hang the pin up board on the wall. 10 | Now for the fun part, pin away!